ronald engel (ronald8e) added a comment to T57741: consecutive bump nodes with image textures give nan in normal pass. While updating our shaders to workaround this bug we noticed that the added bump node could use any texture for height input and the resulting normal pass after adding this to another bump node would be wrong. ronald engel (ronald8e) updated the task description for T57741: consecutive bump nodes with image textures give nan in normal pass. ronald engel (ronald8e) created T57741: consecutive bump nodes with image textures give nan in normal pass. ronald engel (ronald8e) closed T56897: Smoke Simulation Memory Leak on Linux as Resolved. ronald engel (ronald8e) added a comment to T56897: Smoke Simulation Memory Leak on Linux. ronald engel (ronald8e) created T56897: Smoke Simulation Memory Leak on Linux. ronald engel (ronald8e) added a comment to T56376: UI Fonts broken. ronald engel (ronald8e) created T56376: UI Fonts broken. ronald engel (ronald8e) closed T56264: Roughness (at least for glossy shader node) is broken if you link in files saved in older blender versions as Invalid. I'm not sure what you mean with incomplete. ronald engel (ronald8e) created T56264: Roughness (at least for glossy shader node) is broken if you link in files saved in older blender versions. ronald engel (ronald8e) updated the task description for T53878: Render layers with certain passes selected/unselected give broken results. ronald engel (ronald8e) created T53878: Render layers with certain passes selected/unselected give broken results. ronald engel (ronald8e) added a comment to T53835: Disabled Renderlayers still get saved (blank) through File Output Node when connected to Composite Node. 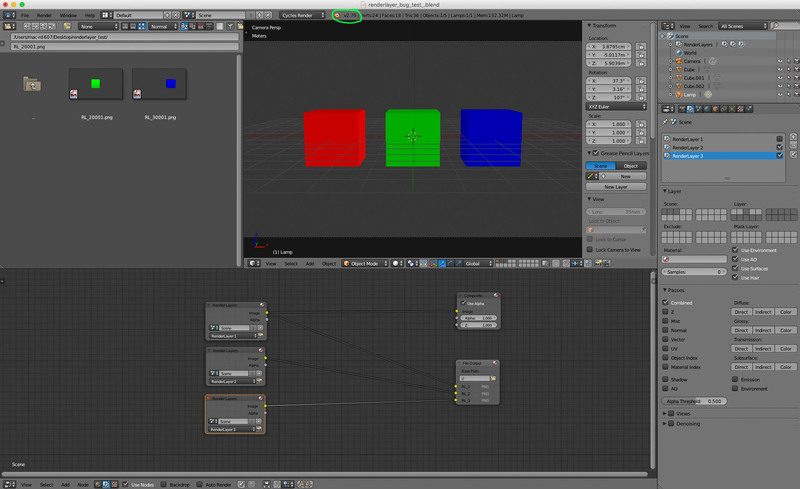 ronald engel (ronald8e) created T53835: Disabled Renderlayers still get saved (blank) through File Output Node when connected to Composite Node. ronald engel (ronald8e) closed T52093: Principled Shader Roughness differs from Linux/OSX to Windows 10 as Resolved. ronald engel (ronald8e) created T52093: Principled Shader Roughness differs from Linux/OSX to Windows 10.
ronald engel (ronald8e) added a comment to T47393: Default Mouse Wheel Zoom broken (changed from zoom to rotation) - OSX only. Thank you - it works now. Magic Mouse behaves like you described it. Scrollball on the Mighty Mouse does zoom again. We tried with OSX 10.11 and a Magic Mouse - same problem. Its the older wired Apple Mouse with the small Scrollball (http://www.gravis.de/Zubehoer/Original-Apple-Zubehoer/Apple-Eingabegeraete/Apple-Mouse.html). I'm not sure but I think its smooth scrolling. ronald engel (ronald8e) created T47393: Default Mouse Wheel Zoom broken (changed from zoom to rotation) - OSX only. ronald engel (ronald8e) created T45694: 2.75a - Splashscreen link to Python Api Reference dont work. ronald engel (ronald8e) added a comment to T44190: custom split normals - images. ronald engel (ronald8e) created T44190: custom split normals - images. ronald engel (ronald8e) added a comment to T44058: Imported custom normals are not working with mirror modifier. Yes I was not sure if this is to be called a bug ... but would be nice if it would work. ronald engel (ronald8e) created T44058: Imported custom normals are not working with mirror modifier.